TBQ'S Book Palace: [Kame's Review]: "Cowboy Justice"
No one is going to try to scare Rachel off her family’s land. She and her sisters have worked too hard to try to save the family farm to let some punks writing nasty graffiti to make her leave the land she loves. A warning shot should get them running for the hills. What happened was a gun fight and Rachel needing to call the one man she tried hard to stay away from; Vaughn. Most of the time when you read an opening chapter of a book and there is a gunfight, it generally is between the big alpha male hero and the bad guys. Rachel does engage in a gunfight to defend herself and her property; and in the same chapter had a touching moment too. Rachel is a complicated woman; she has been taking care of her sisters long before her parent’s death, she shoulders much of the responsibility of the farm and a lot of guilt too. She and Vaughn had a secret affair that Rachel ended when her mother committed suicide. The affair and their remaining feelings are referred to often in the book. This is my first book in this series; and since I was not fully aware of Rachel and Vaughn’s history I found it took me a chapter or two to get vested in their romance. Vaughn is a hunky cowboy lawman. Much of the book he struggles with his feelings for Rachel and his desire for revenge. Vaughn has a great relationship with his parents; and his conversations with his Dad were some of my favorite scenes. Even though there is an investigation going on Rachel and Vaughn produce some steamy scenes. They also almost brought me to tears a few times too. This is a very detailed book, so read it slow and enjoy. The details make scenes memorable. I found every character, no matter the length they were in a scene, a joy to read. Rachel has a love of photography (I do too) and has dreams close to home and far away. There was one small detail about Vaughn that is revealed early in the book that he uses to show Rachel the depth of his feelings and his willingness to try new things. That scene could have easily been done another way but I think the way Melissa Cutler wrote it was refreshing. 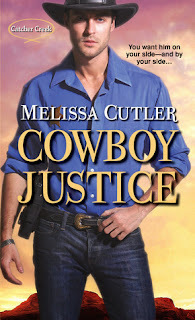 I am quiet open with my love of everything cowboy and Cowboy Justice did not disappoint. If you have time read The Trouble With Cowboys (Catcher Creek #1) before Rachel and Vaughn’s book, I plan on reading it before How To Rope A Real Man (Catcher Creek #3) releases in May. *Note: The quotes used belong to Melissa Cutler; Kame and TBQ's Book Palace do not claim them. Have you read Melissa Cutler before? Do you have a favorite book of hers?